When people ask "How are you? ", I don't really know what to say. The truth is that no matter how many uplifting pictures of flowers and gardens I post here, or how many lovely supportive comments everyone makes (and I do appreciate it, please keep doing it! ), I'm just not that great and there are times when I really can't see the point of anything at all. Yes, I know I haven't been well and I've just finished the antibiotics, etc etc. But I can't escape the reality: I am on my own, and some days I don't have the faintest idea how to manage my life even till bedtime. And writing this blog to say so is sometimes the only way to avoid going to bed and staying there. I think you are very brave to share this Anne, and I'm sure it will help a huge number of people who feel the same but also feel under huge pressure not to admit it publicly. I hope the sun shines in Wellington this weekend and you get to do at least two pleasurable things in it. What an understanding comment, Sandra thank you. I'm just about to create a new bog list for Elsewoman and yours is going on itimmediately. Anne. I hope that putting your feelings into words helps, at least a little bit. Cry, lean on those people who surround you with love and support, read, listen to music, cook and write and walk; and slowly, slowly, learn to get through the days. Next month it will be four years since I lost the love of my life - sometimes it seems a very long time, but at other times it hurts as if it were yesterday. One never gets over the loss, but one has to, somehow, learn to manage it. Alexia, thank you - the best help always comes from people who've been through the same thing. And yes, writing about it always helps, as do some really silly things - last night I found online jigsaws of New Yorker covers and spent a remarkably carefree hour playing with it. Jo, that's a lovely message - and having got so low and said so, I do now feel I've got lots of good things to look forward to in October. As Alexia says, it's just one slow step at a time. I really feel for you, as i know how easily one can be knocked back when living alone and dealing with grief. Being sick sometimes feels like the last straw - and a post-viral depression can often follow. It does get easier, I've found. Living alone after having someone there means a massive shift and adjustment. But now I find that contentment has become the default position. I write in my journal each evening before sleep, just so I have someone to tell about my day. Of course it's not someone, but I always remember how Anne Frank started her diary with 'Dear Kitty . . . ' and how that worked for her. Thank you for your response on the last post. One never knows how the comments are being received. I began writing this blog just for my own sake, much as you write in your journal, Juliet. And of course it's so easy to feel, too, as if I'm always the needy one. So thank YOU, Irene, it's marvellous for me to know that what I write is useful for other people going through very similar experiences. We need each other! 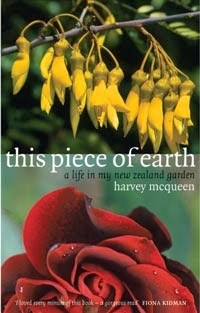 As spring unfurls, perhaps you have an extra layer of adjustment to navigate - remembering Harvey's love of the garden. His joy in the Tui visits reminds me of your challenges each time they visit our garden. And this week we found the first asparagus sprouting and again I thought of you both. Your hardest moments of loss seem to echo the scale of just how expansively you enjoyed life together. Fondest thoughts Anne as the spring squalls of life move up the country and through some of our hearts.